Long before Sandusky, Ohio's Cedar Point was known as the "Roller Coaster Capital of the World", it was a popular vacation destination for the local railroad, fishing, and shipping industry employees and their families. 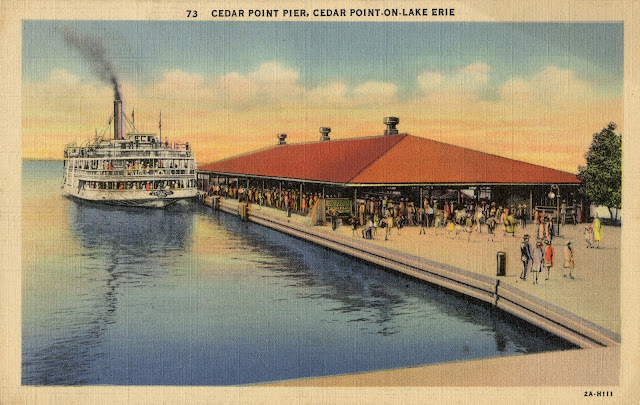 Cedar Point as an amusement park opened in 1870, with recreational areas, bathhouses, dance halls, and lodging quarters. 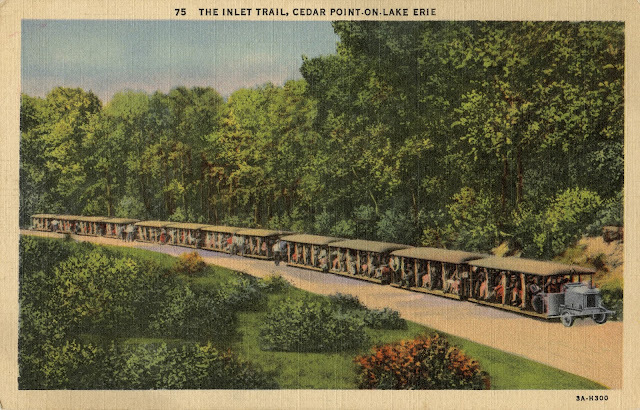 Shortly after electricity was installed at the park in 1891, the park's first roller coaster opened -- the 25-foot tall Switchback Railway, which topped out at the breakneck speed of 10 mph. After the turn of the century, rides and attractions were being added in rapid succession to meet demand. 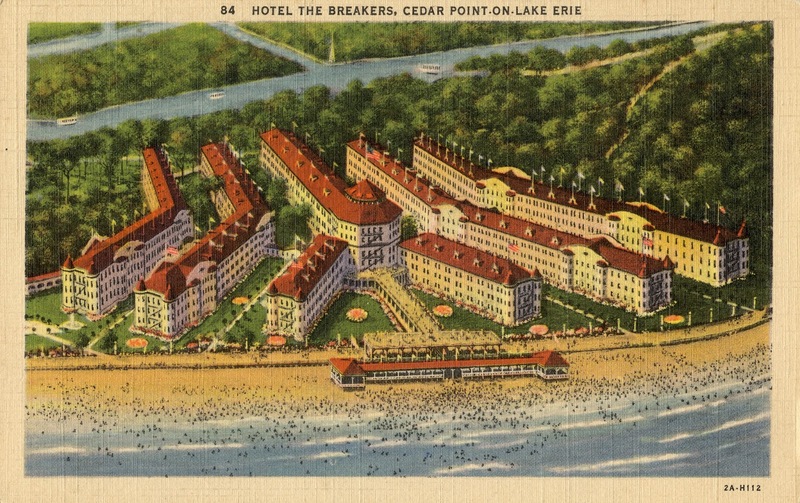 In 1905, the 600-room Hotel Breakers opened and still stands to this day, despite the fact that major additions and renovations over the years have altered the original building to the point of the site being removed from the National Register of Historic Places, where it was first listed in 1982. 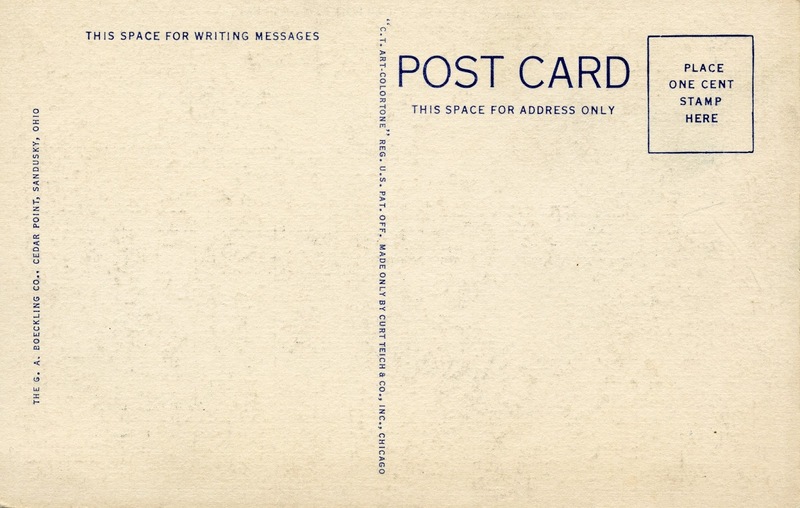 It was after WWII that changes at the park drastically began. Much of what remained from the early days was neglected or outdated, to the point that Cedar Point was without a functioning roller coaster. During the 1950s and well into the 1960s many new rides were added -- exciting rides, thrill rides -- which caused an upswing in popularity that has brought the amusement park -- now the second oldest in the country -- to become a destination not just for regional vacationers, but coaster enthusiasts from all over the world. I picked up these three linen postcards this week, gorgeous representations of Cedar Point's offerings in the 1920s. 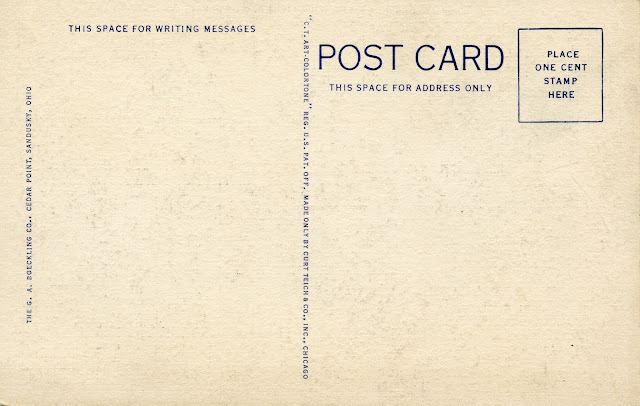 The back of each is printed with "The G.A. Boeckling Co., Cedar Point, Sandusky, Ohio". George Arthur Boeckling was the president of the Cedar Point Pleasure Resort Company from 1897 until his death in 1931. He is responsible for the surge in popularity Cedar Point went through in the early part of the century, and was often referred to as "the man who made Cedar Point".